Man-made global warming is dead (surprise, surprise). Replacing Obama: NEW Fox News ROCK STAR! Why Are Wind Turbines Not Worth Maintaining? Al Gore says carbon dioxide-induced greenhouse warming causes all bad weather; tropical snow included. Reducing carbon dioxide emissions will not slow down the next ice age. These come without asking about carbon dioxide, courtesy of solar magnetic cycles, if history is any indication. Another Little Ice Age may be coming; we don’t know, because instead of researching their causes, we have been studying how to “sequester” carbon dioxide in old mines, at the behest of Al Gore and Company. Reality could be as bad as the picture below; in your children’s lifetime, or sooner. The one thing I can think of that is more ill-advised than ignoring history, is ignoring the present; with Al Gore and his greenhouse models you get both. Gore’s predictions have been wildly incorrect; but the present climate, temperature, and weather, which show that Earth and oceans are cooling, is ignored in favor of the non-predictive computer model! The hazards a new Little Ice Age holds in store for humanity are indeed great. Temperatures warmer than the present by 7 degrees Farenheit, as occurred during the medieval warm period, on the contrary, brought a golden age of vigorous cultural growth to humanity. The next Little Ice Age will cause widespread starvation and disease, as did the last one, but on a scale proportionate to the increased population, possibly worse. Ask your congressperson why Al Gore’s computer models have never worked. Ask for the real data validating the models. There isn’t any. Like OPEC, the United States Senate wants oil prices to stay high! Accordingly, supply in the United States will not be increased, even if oil reaches $10 per gallon, per Senator Ken Salazar (D) of Colorado. That makes the United States Senate worse for Americans than OPEC. OPEC recently increased oil production when the price of oil hit $120 per barrel, corresponding to gasoline prices around $4 per gallon. We can’t do much to change the composition of OPEC’s governors. But we surely can do something about the United States Senate. We can, and must elect senators and congresspersons who will permit Americans to maintain and increase energy supplies, including oil, natural gas, coal, and nuclear energy. The present Senate and Congress is far out of touch with America’s needs, and out of touch with climate reality which portends a great risk of much colder weather in the next few years. We can do without air conditioners in many cases during the summer, but we cannot do without heat during the winter. Joe D’Aleo, of ICECAP, succinctly summarizes global warming below. There may well be a calamitous price to pay for decades of lies about climate and carbon dioxide. Extended solar minima are typically accompanied by pronounced global cold. If crucial decades of cold, warmth, and true climate data had not suffered arrogant erasure to feed the global warming construct of Al Gore, humans might remember the Dalton Minimum and the Maunder Minimum with some well-deserved, healthy concern. But sadly, the facts had to be removed, and the lie is sustained at the expense of human appreciation for the sometimes harsh realties of life on Earth. Prospects of this boreal growing season are not improving. News of late frosts, snow, and cold, and late planting continuously sneak through the artificial carbon clamor. Is Al Gore concerned about food shortages? Not on your life! Al Gore is concerned about selling useless carbon credits to his unsuspecting, naive clients. The potential for catastrophic food shortage grows with every day. There is not the first inkling of concern from government, and governments, utterly invested in anthropogenic global warming as a political and financial tool. And Cycle 24 is nowhere to be found. The Sun remains ominously quiet. I haven’t yet seen many articles in the popular media linking the expected cooling, or current stasis in temperature rise to the biofuels mania, and then predicting the “perfect storm” for reduced food production that will lead to widespread starvation in the developing world. Numerous articles about crop diversion for energy use, of course. But not many speculating on what happens if worsening weather conditions also occur. In the US, corn and soybean planting has already been much delayed by the weather and there is now widespread doubt about the size of the potential harvest. I am reminded of the days in the mid to late sixties when my own relatives in Saskatchewan, Canada suffered through year after year of early frost, too much rain, not enough rain and then late frost, all affecting growing conditions and essentially destroying or reducing their wheat crops. We have had relatively benign conditions for food crops world-wide, over the last 4-5 years. With the diversion to biofuels, continued increase in population and continued demand from the rising middle class in China and India, it only takes a couple of years of bad weather in the worlds bread or rice baskets to equal millions of deaths. From what I read, wheat stocks are reduced around the globe. There won’t be any warehoused grain to go to for aid shipments. It’s all being sold off to the ethanol folks. A dark day could be coming. The temperature that matters most on Earth, that of our oceans, stopped going up at least five years ago. Not only did it stop going up, the temperature of the oceans is decreasing. The cooling of the oceans is not caused by greenhouse warming due to anthropogenic carbon dioxide. In fact, it proves rather conclusively that greenhouse warming due to anthropogenic carbon dioxide, or any carbon dioxide at all, is a vast fraud of planetary proportion. Where is this ocean data? Mum is the word, except: “It is not anything really significant. 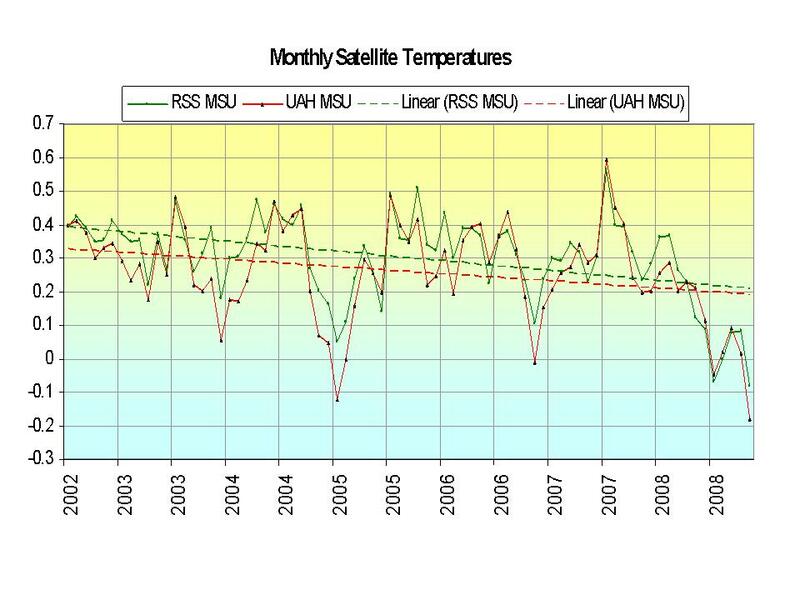 It may be we are in a period of less rapid warming,” according to Dr. Josh Willis. That would be fine; except an observed anomaly in the surface, to 2000 meters, of the ocean should be at least 500 times as thermally significant as the same deviation in the atmosphere (I am hoping for comments on this point). The exchange mechanism of energy between ocean and atmosphere is important, of course. That the ocean is a heat reservoir of vast proportion compared to the atmosphere, though, is undeniable. Except for the reluctance of the guilty parties to recant on the error of their previous incantations, global warming is indeed dead. But the data is already out! There is no need to wait for deniers of science to come clean, however reluctant these may be. The oceans have stopped warming! Sunspots may be related to Global Cooling (which is dangerous) and Global Warming, which is not. At least, sunspots always were in the past. The 2008 winter was the coldest in 40 years for the upper Midwest, Plains states and most of Canada. Minnesota newspapers report that this year’s opening of the locks to Mississippi barge traffic, delayed by three weeks, was the latest since the modern waterway opened in 1940. Eau Claire, where “old-fashioned winters” have been a thing of the past, recorded 43 days of below-zero temperatures, while folks down in Madison shoveled away at a 117-year record snowfall throughout the season, as did many in New England and Canada. Rare snowfalls struck Buenos Aires, Capetown, and Sidney during their mid-year winter, while China continually battled blizzards. Even Baghdad experienced measurable snowfall. Antarctic pack-ice far exceeded what Captain Cook saw on his 18th century voyage into the Southern Ocean. On the continent itself the miles-thick ice continues to accumulate despite peripheral melting along the Antarctic Peninsula and occasional calving of an ice block. At the opposite pole, flow-ice once again spans the entire Arctic Ocean, and by April it had extended into the Bering Strait, making up for the much heralded melt-back last summer. From January 2007 through the end of January 2008, the average global temperature fell by nearly a degree Fahrenheit, based on data obtained by the MET Office in Great Britain and other international temperature monitoring networks. What are we to make of this? The recent climate conference held in New York City, sponsored by the Heartland Institute, provides some answers. Several hundreds climatologists in attendance dispelled notions that the global warming debate is over. Most attendees, who readily acknowledge the existence of post-Little Ice Age warming, believe man-made emissions are unlikely to cause major climate change and signed a declaration to that effect. Bill Gray, dean of hurricane forecasters, attributed short-term climate change to slow-moving deep ocean currents that result from variation in the salinity of water sinking near the poles and ultimately welling up again along the coast of South America. These fluctuations account for the comings and goings of the familiar El Nino/La Nina cycles and the longer Pacific Decadal Oscillation that stretches over a large area of the eastern Pacific. Solar experts highlighted how sunspots, and associated magnetic storms on the Sun’s surface, affect Earth’s weather and climate. The previous (very strong) 11-year sunspot cycle, associated with the recent warmth, ended in 2007, after having peaked in 2002. The new cycle should have already begun, but hasn’t yet. In the absence of sunspots, solar flares are minimal. Flares eject massive streams of electrons and protons outward from the Sun. A portion of this stream, called the “solar wind”, bathes our planet producing the aurora and interfering with communications. The solar wind, as it interacts with Earth’s magnetic field, also protects us from the harmful effects of cosmic radiation. During periods of weak solar activity – as at present – cosmic rays (high-energy protons originating in interstellar space) penetrate through the troposphere and ionize oxygen and nitrogen molecules. The ions become nucleating sites for water vapor that condenses into clouds. And when sunspots are at a minimum, more clouds form and correspondingly more sunlight is reflected back into space. The enhanced reflectance (albedo) cools the Earth. We all have experienced how quickly the temperature drops when the sun ducks behind a puffy white cloud on a warm, dry afternoon. Past cool periods, identified with the late stages of the “Little Ice Age” and with the Maunder and Dalton climate minima, closely correlate with low sunspot numbers (astronomers have kept close tabs on sunspots since Galileo’s time). Some solar-physicists are now saying if the current cycle doesn’t begin to produce spots soon, we can expect a cool-down like the 19th-Century Dalton minimum – or worse. Decades-long cooling in the past brought crop failures to Europe from repeated summer frosts and restricted growing seasons. With grain shortages already staring us in the face, we’d be advised to begin thinking about a global cool-down instead of a warming that may or may not continue. We might consider ways to transform semi-desert into arable land and to develop seed with shorter maturing cycles suitable for a sub-boreal grain belt. If cooling should begin in earnest, we will quickly forget global warming as we face the new challenges ahead. Balgord, a consultant and writer, heads Environmental and Resources Technology in Middleton. Please see SOURCE for numerous, relevant, links. (In edit, the links at Leader Telegram are useless. Sorry). In Kansas, fence-posts often are made from stone. There is not much to burn, if you need to stay warm, and there is no power. TOPEKA | Gov. Kathleen Sebelius today vetoed legislation to allow a sizeable coal plant expansion in western Kansas. The bill would have eliminated the discretion a state regulator used last year to block Sunflower Electric Power Corp.’s plans to add two coal-burning generators to its existing Holcomb, Kan., power station. Sebelius said that she couldn’t support an erosion of an environmental regulator’s powers and that the bill didn’t do enough to encourage renewable energy. “Instead of building two new coal plants, which would produce 11 million new tons of carbon dioxide each year, I support pursuing other, more promising energy and economic development alternatives,” she said in a statement accompanying the veto. The long-anticipated veto sets up a showdown with the Legislature, where leaders are counting votes to see whether they have the two-thirds majorities needed to override a veto. Debate and controversy surrounding the coal plant, climate change and state energy policy have dominated the 2008 legislative session. In her veto message, Sebelius reiterated her offer to negotiate with lawmakers and Sunflower to reach a compromise. She has said she would support a plan calling for only one generator. She also announced that she will form a new group, the Kansas Energy and Environmental Policy Advisory Group, to investigate ways the state can encourage reductions in greenhouse gases. The vetoed bill included some modest environmental initiatives, including new renewable energy standards for many utilities and a provision to allow those with solar panels on their homes to sell excess power to their utility. Many lawmakers, led by the House Speaker and Senate president, argue that there was no legal basis for the rejection of the power plant and that the decision is costing the state jobs and economic investment. They warn of higher electric bills for western Kansas and accuse Sebelius of pandering to environmentalists. The Senate appears to have more than enough votes to override the veto. The House, however, appears to be several votes short. The Legislature has 30 days to attempt an override. Anthony Watts – Watts Up?